alaTest har samlet og analyseret 253 anmeldelser fra magasiner og hjemmesider. Folk kan virkelig godt lide muligheden for at medtage. Også størrelsen imponerer, men hukommelsen værdsættes ikke af folk. Vi analyserede bruger- og ekspertratings, produktalder og andre faktorer. Sammenlignet med andre Videokameraer får Transcend DrivePro 200 en samlet alaScore™ på 88/100 = Meget God kvalitet. 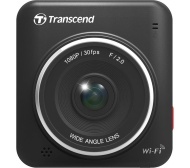 Record all your journeys in HD with this dash cam from Transcend - we review the DrivePro 200. It may lack GPS, but this is a dependable dash cam which should provide the evidence you need if you're ever involved in an incident while driving. The Transcend DrivePro 200 dash cam undercuts many rivals on price and offers good daytime video quality. But how does this dash cam fare when the sun sets? Read our full review to find out. Randomly stops recording in the middle of use and needs to be rebooted to solve the issue. Not a reliable unit and I am currently in the middle of a warranty claim. Easy to install with good image quality.